I'm a bit of a salsa connoisseur. When I go out to a Mexican restaurant (Rosita's is my favorite in Seattle), it's usually the salsa that brings me back (I actually love Azteca salsa, too). But I also like my salsa at home, and since I'm not very good at making it I have to buy it. So, I'm always looking for something new. Recently, while shopping at Whole Foods in Seattle, I picked up a small tub of Seattle-made Salsa de Rosa. Let's just say this is some of the best salsa I've picked up in a store. Why is this stuff so good? First, it's all natural--and you can taste it. It's like someone made fresh salsa in my kitchen. It's a chunkier, finely-diced salsa that delivers its tangy flavor with bits of tomatoes, onion, garlic, cilantro, tomatillo and jalapeno. I've tried Salsa de Rosa on eggs, chips, and even a little on a hamburger, and it made everything taste better. Well, to modify a line from one of our favorite movies, "Tommy Boy", I guess we could "crap in a cup and slap a $2.99 label on it, but then you'd be paying $2.99 for a cup of crap wouldn't you?" Why don't you spend the few extra cents and get a GREAT quality product like ours? It's worth it. Besides, many of our competitors actually sell their salsa in 14oz sizes; whereas we use a 16oz in stores. Make sure you check the "cost per ounce" to get an accurate "apples to apples" comparison. You may be pleasantly surprised with the results! If you like salsa, do yourself a favor and pick up a tub or two--and be sure to put it in the fridge right away, as there are no preservatives.You can even order it over the Internet. 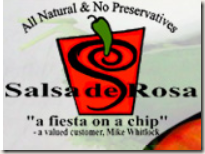 According to the the frequently asked questions section of the Salsa de Rosa website, you can get their salsa in over 60 stores, including Safeway, QFC, and the aforementioned Whole Foods. If you like to really feel the heat, then Extreme Heat is for you! Not only do we add a significant amount of jalapeno but we don't spare the habanero, either. It's what I like to call "a giant step in front of our Hot". We don't call it (el bombero) "the fireman" for nothing. Let me know if you've tried Salsa de Rosa -- or if you have any others you'd like to recommend.